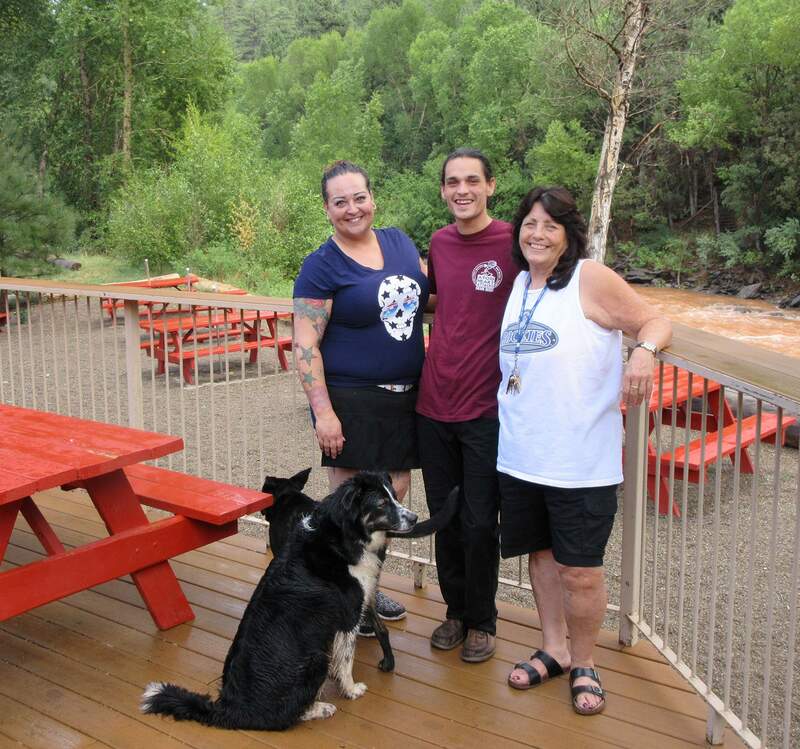 The River Bar and Grill staff shows off the back deck with views of the Dolores River. From left are server Misty Switzer, cook Johnny Lopez and manager Debbie Valerio. 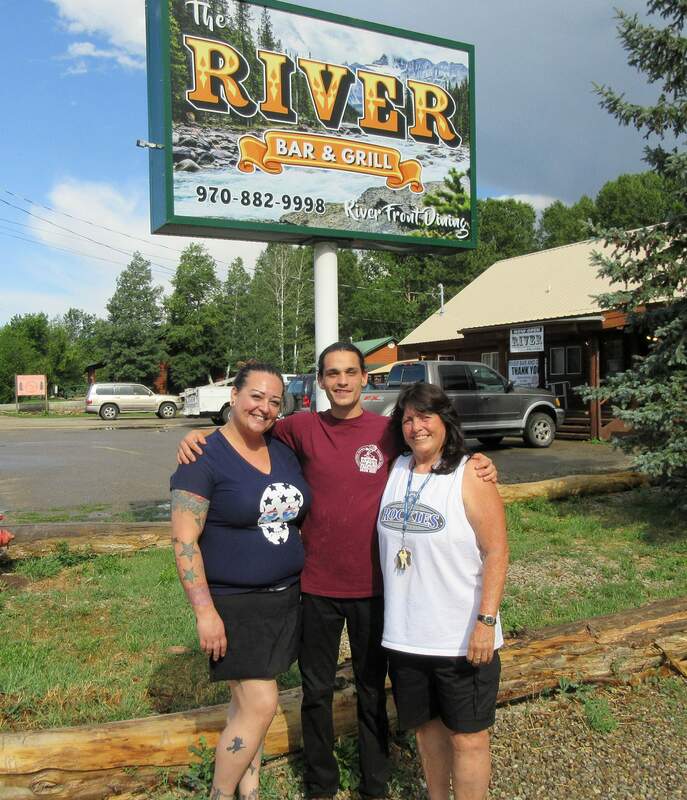 The River Bar and Grill staff Misty Switzer, Johnny Lopez, and manager Debbie Valerio are ready to serve locals and tourists. All fun flows to The River Bar and Grill, a rejuvenated sports bar, restaurant and honky-tonk on the shores of the Dolores River. General Manager Debbie Valerio is on a mission to create the best entertainment and dining venue for locals and visitors. “We’re bringing back to town that welcoming, old-time country-bar feeling,” Valerio says. She plans regular live music with no cover charge, karaoke nights and pool tournaments. Catch the game on TV or visit the outdoor “River Stadium” for some horseshoes. The menu is classic pub fare, specializing in pizza, burgers, sandwiches, salads, fish and chips, wings, sliders and Irish nachos made with sidewinder potatoes. There is a kids menu, too. There are quiet dining areas for families and lunch dates, and a large bar with a dance floor and stage for bands and the evening crowd. The relaxing alfresco dining experience on the back deck while watching the river flow is unmatched anywhere in the county. Rafters and kayakers love landing at the venue’s beach for a refreshment or two. Valerio says The River is positioned to fill the void left after the popular Hollywood Bar tragically burned down in 2012. They even nabbed the same phone number. The River would like to involve the community by inviting plein air artists, a massage therapist and craft makers to set up on the deck on a rotating basis. “We are always open to suggestions,” Valerio said. The River has a seating capacity of 326 and can accommodate private parties, weddings, conferences and family reunions. The River is at 1319 Railroad Ave. and is open seven days a week. The restaurant is open from 11 a.m. to 9 p.m., and the bar is open from 10:30 a.m. to closing.